Iraqi forces are preventing the delivery of fuel to Iranians refugees in Camp Liberty, impeding the transfer of critically ill patients to hospitals. According to reports and documents obtained from inside the Iranian regime by the Iranian Resistance, Nouri al-Maliki’sNational Security Advisor has ordered repressive Iraqi forces in Camp Liberty to intensify the pressure on and blockade the Iranian refugees in the camp. The repressive measures include limiting resident’s access to outside the camp as much as possible, and taking measures to make residents feel unsafe in the camp. The orders by Nouri al-Maliki were given to Iraqi National Security Advisor Faleh Fayyaz following last month’s trip to Baghdad by Ali Shamkhani, the Secretary of Supreme National Security Council of the Iranian regime, and Qassem Suleimani, the commander of terrorist Quds Force. Based on these orders, Iraqi forces under Maliki’s command have escalated the inhumane medical siege on the camp, preventing the delivery of fuel and other basic necessities to the camp, along with other repressive measures. 1. On Monday, August 18, the Iraqi forces have prevented the transfer of six patients to hospitals while they had previously arranged medical appointments in Baghdad. One of the patients is suffering from advanced cancer and needs chemotherapy. On Sunday night, August 17, Maliki’s agents led by Major Ahmed Khozeir, a main agent involved in numerous massacres in Camp Ashraf, informed the residents that only one of the six patients could go to Baghdad. But the next morning they blocked the transfer of even that one patient. 2. On Tuesday, August 19, Iraqi forces prevented the transfer of five patients to Baghdad who had pre-arranged medical appointments. One of them had an appointment to undergo surgery. During the past six years, Maliki’s government has imposed inhumane medical blockades that have lead to the deaths of 20 Ashraf and Liberty residents. 3. For the past 8 days, Iraqi forces have been preventing the delivery of fuel to Camp Liberty. The lack of fuel has led to power generators being turned off, cutting off the only source of electricity to all vital necessities at the camp such as pumping and purifying water, the kitchen and reefer units and basic medical services. 4. Iraqi forces have in recent days prevented the entry of trucks which transfer black water to outside the camp. Since the residents first were transferred from Camp Ashraf, they have been renting the trucks at their own expense. This causes contamination at the camp and the spread of infectious illnesses during the summer heat. 5. These forces have also been preventing the delivery of cleaning substances needed to purify water, leaving the residents facing a hygiene crises. 6. On August 18, after hundreds of follow-ups and letters, Iraqi forces finally allowed the bodies of six residents killed in the latest missile attack on Liberty on December 26, 2013, to be buried. But, in a continuation of repression, they did not allow the family members and friends of these martyrs take part in the burial ceremony. 7. Contrary to previous agreements signed under the supervision of UNAMI and US Embassy, Iraqi forces have blocked access to the residents’ own forklifts, forcing them to lift heavy loads with their bare hands. 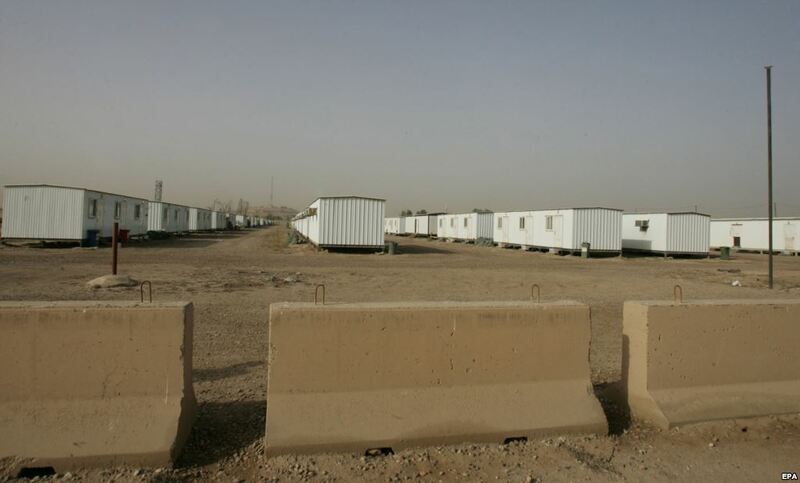 The Iranian Resistance said in an statement on July 26 that in a meeting with Maliki and Faleh Fayyaz, Shamkhani and Suleimani demanded the intensification of suppressive measures against Camp Liberty residents in order to create an unsafe and intolerable atmosphere for the residents. Camp Liberty residents and their representatives and lawyers along with parliamentary groups and human rights groups have time and again protested against these suppressive measures and demanded the intervention of the UN, US, EU and other relevant bodies, yet unfortunately the UN reports on Iraq make no mention whatsoever of these suppressive measures. The Iranian Resistance, while noting the repeated and written commitments of the US Government and the UN towards the safety and security of Liberty residents, demands an urgent intervention to provide the minimum security and humanitarian measures at Camp Liberty, especially the residents’ open access to medical services.